The digital water meters that we have in stock are economy water meters. They have a flow rangfe of 3 GPM to 30 GPM or 10 LPM to 100 LPMs. These flow meters are designed by Great Plains Industrial Meters. Built for both indoor and outdoor usage, they perform for years to come. Made to measure water, you can have your choice to measure in gallons or liters. It is also made of nylon. These digital water meters will give your company a great benefit. Find out if there are leaks, and explore ways to fix them. 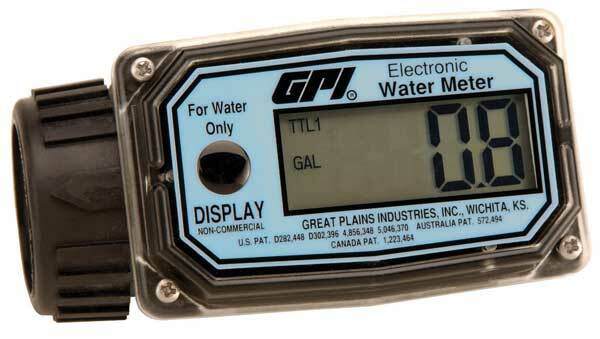 Order your digital water meter here. Also look for our fuel meters! Are you interested in finding out more about how your facility can use a digital water meter? Get in touch with one of our representatives at (888) 722-3569 or contact us online!